Leiden is reconstructing the area around its Central Railway Station. One of the new buildings on Stationsplein (Station square) will have a basement with space to park nearly 5,000 bicycles. The building site is currently being prepared. The actual building will start in the summer of 2016 and the opening of this large facility is expected in 2018. Trying to find a parking spot in the half underground bicycle parking facility at the station square of Leiden. 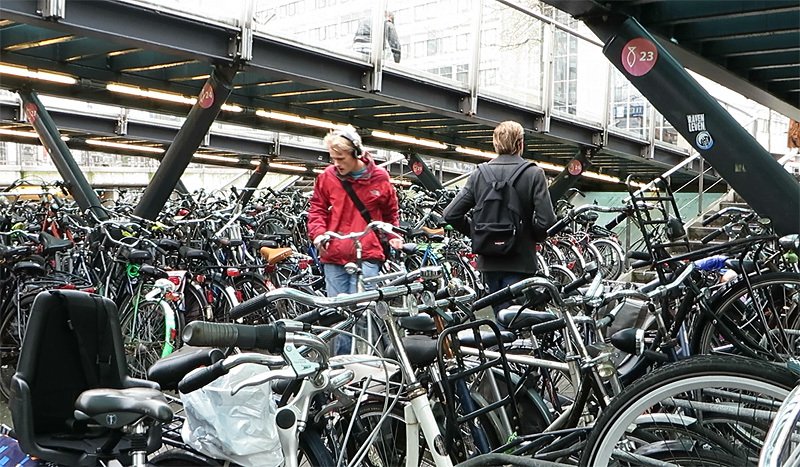 I was in Leiden quite some time ago and filmed how people could park their bicycles at that moment. For reasons I forgot I never used that footage, but with the news of the new bicycle parking facility I thought it would be nice to show you the images after all. 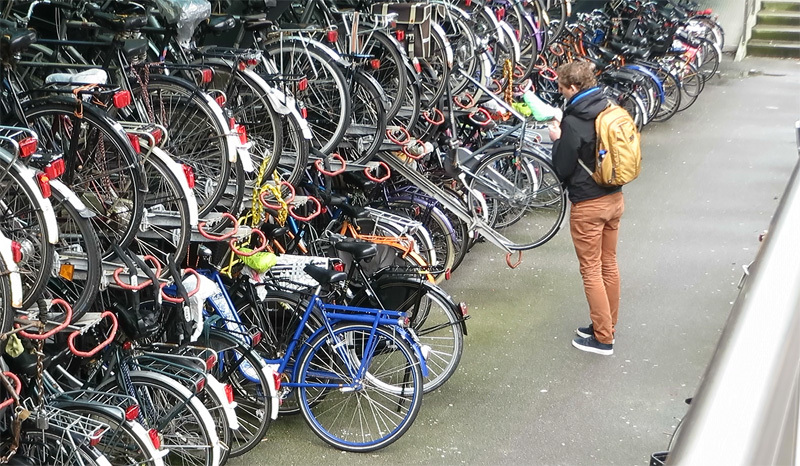 Like most cities in the Netherlands, Leiden has a lot of bicycle parking racks all around the station. The location I filmed is just one of those facilities. It is the one closest to the main entrance, in fact it is right in front of it and it is combined with the taxi stand. The taxis drive on a deck a bit over ground level, the bicycles can be parked a bit below ground level. The half underground bicycle parking facility with the taxi deck over it on the left. The parked bicycles on the right hand side have been removed. That is now the building site of the large building mentioned in this post. When I filmed this half outdoors parking facility it was completely open and not guarded. It was also not the best looking facility I have shown you and it seemed to be filled well over capacity. But things have changed. Early 2015 the city of Leiden did a lot of maintenance on this facility. They cleaned it and made sure that (seemingly) abandoned bicycles were removed. They also closed the entrance at the Station entrance side and introduced supervision. With someone at the gate, the operating times were changed from open 24/7 to open from 6am to 1am every day. The object was to reduce the number of bicycles parked outside the racks and to give pedestrians more walking space on the station square. Most of the racks have an upper part too that is very easy to operate. The reopening was in June 2015 and the local press reports that everybody started to complain right away. Since the entrance on the station side was closed, people had to ride all the way to the other side to get in. That was not all. The city forgot to make an entrance for pedestrians. So after you parked your bicycle you had to walk all the way back to the wrong side, get out and walk all the way to the station entrance again, on the street. The city had to admit that that was a bit much and they created an entrance for pedestrians at the station side after all. 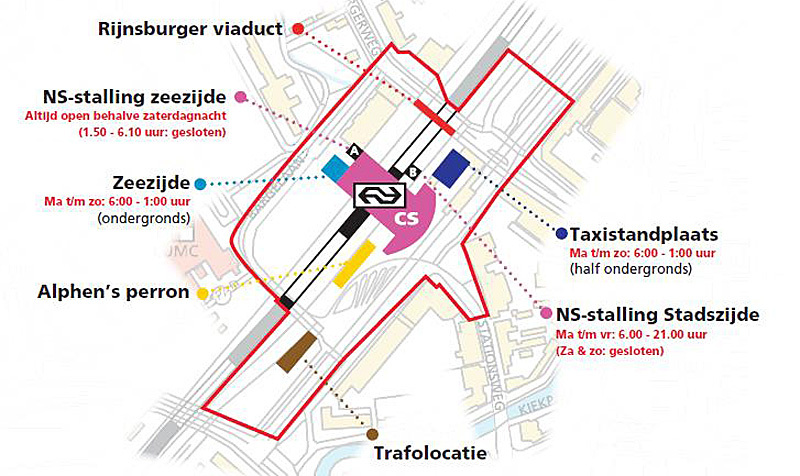 There are currently 5 locations to park your bicycle around Leiden Centraal. Some of which are guarded. This was to be a trial for 3 months, but I see on the website of the city that the situation is still like that. So apparently they have kept this facility as it was in the trial: a guarded bicycle parking facility, with limited opening times, but free to use. 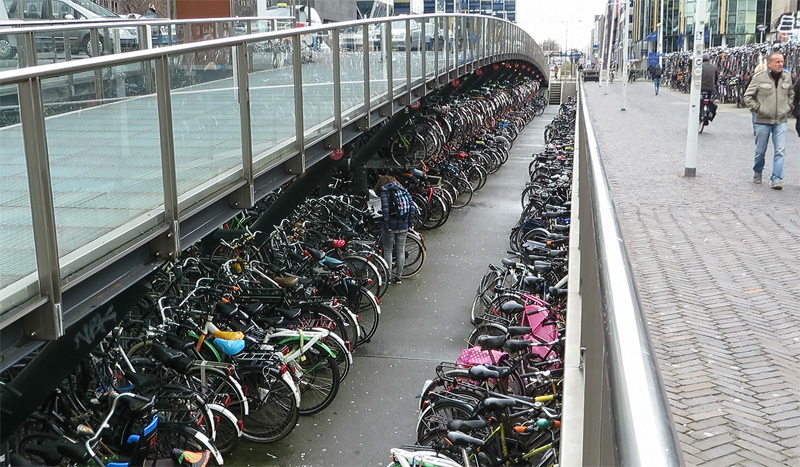 My video of the half underground bicycle parking facility at Leiden Centraal Station. Now a bit more information about that new bicycle parking facility. There had long been empty space, right at the station square, that had to be redeveloped . The gap looked really ugly. For a number of reasons it took years before a plan could materialise, but now finally a building is going to be built. 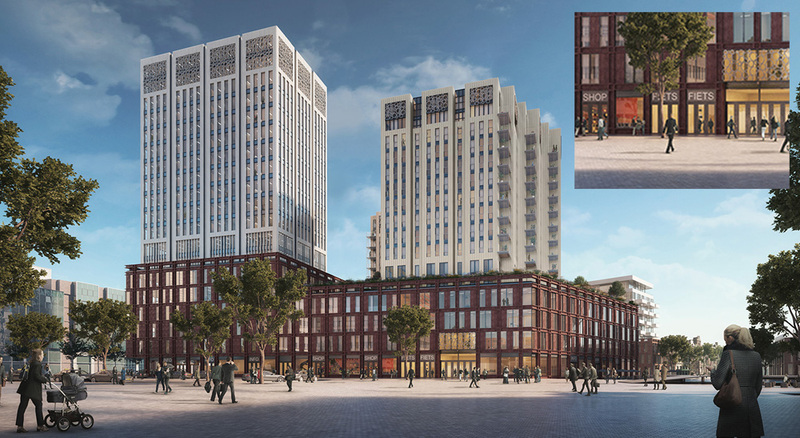 In the typical developer’s language: “The area’s transformation will create an attractive urban space in which the old inner city is reconnected with the Central Station, introducing a worthy entrance into the city of Leiden.” The large building will have several functions. The lower floors cover the entire plot and are more public with offices and shops. There will be three towers on top of the plinth in different heights. Two of the towers are purely residential, the third is an office building. 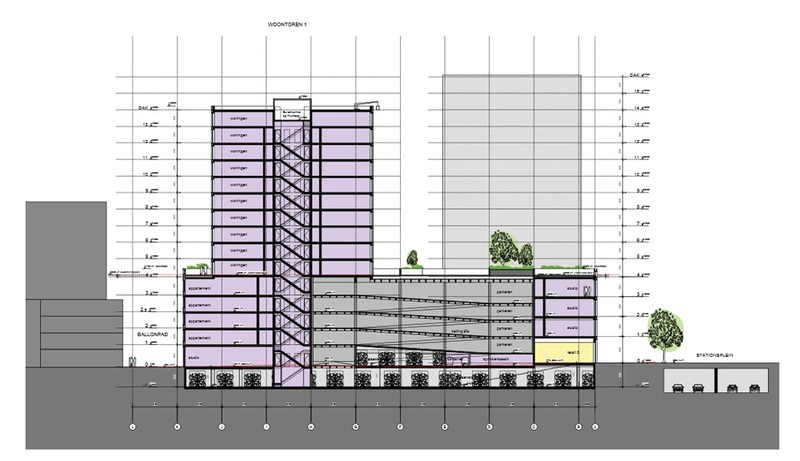 Apparently the tallest tower will have 16 floors, which is a lot for a historic city centre in The Netherlands. The new block at the Leiden station square, for which building will start in the summer of 2016. The inset shows the entrance to the bicycle parking basement. Two doors marked with the word “FIETS” (bicycle). The 55,000 square metre building also includes a parking garage for cars, but the basement floor will be entirely used for a bicycle parking facility. Rows and rows of stacked racks will give room to park nearly 5,000 bicycles. The entrance will be at the station square. This will be a very attractive location to park your bicycle if you want to travel further by train. Combining bicycle and train travel is very common in the Netherlands. The cross section clearly shows the double stacked bicycle parking racks in the basement of the new building. Note the tunnel to the right. There is actually a 4 lane road hidden under the Leiden station square. But people will have to have a bit of patience. Building will commence this summer (after the building site has been prepared, something that has been going on since the end of last year). The bicycle parking facility in the basement is expected to open in 2018. The website of the city of Leiden offers a presentation of this building in PDF. The plan for the bicycle parking basement. 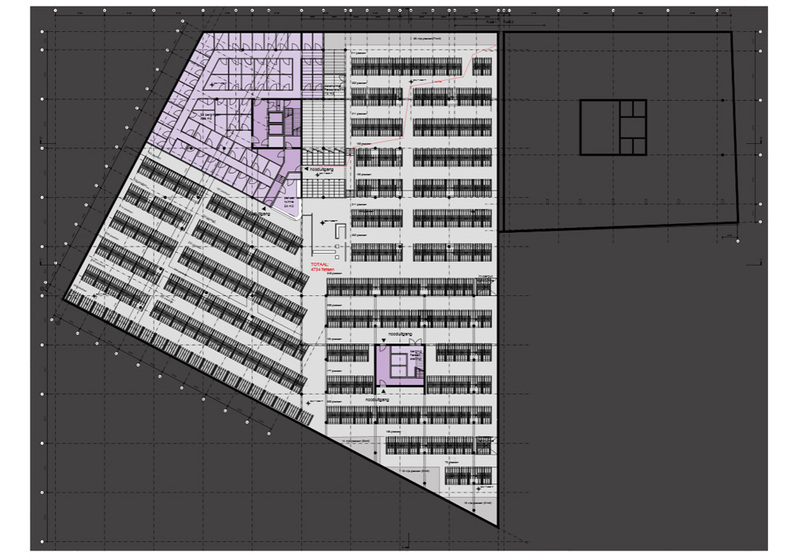 The total number of spaces in the racks is 4,734, but there is also space to park bicycles that would not fit in racks, such as cargo bikes and bicycles with baskets at the front. This bicycle parking facility is highly used and top competition for a small storage. Your blog is full of useful information and it is trule inspiring. I wanted to ask which Dutch companies build bicycle parking facilities abroad?. I would love for some guidance. I am really surprised at the plan to build yet more offices, when so many of these are already empty and unused. Lots of them are now being converted into other designations, like housing for students or refugees. Nice article btw Mark, thorough as usual! Usual? When has he delivered a less than great (with a couple grammar mistakes) blog post? Could you please stop commenting? You are spoiling the whole blog. It is not your personal Q+A. People who want their theories and ideas adopted by others want people to ask questions about related questions, like how bus stop bypasses work for pedestrians or as I asked, how pedestrians get priority over other traffic at intersections, because it resolves fears and opens up discussion for how it can be improved sometimes. If you never ask questions you never get anything done, just like how Newspeak discouraged questioning the establishment to the extent that it would have been repressive. Cut the crap, at least. Your main interest seems to be related to soft drugs use. And get on your bike, if you have one. You seem to spend every waking moment on the internet. (If you respond to this, don’t expect an answer from me. I won’t look at this website again until next Tuesday). I don’t really care if adults use soft drugs, so long as they treat it with the kind of respect alcohol needs. I do have a bicycle, and I use it very often, even during cold winters. I would like to know how the designs the Dutch use work for pedestrians? Sure I know they have their own traffic signals, buttons and sidewalks, and modern designs include wheelchair ramps and tactile paving, including at the bus stops (raised 20 cm curbs and tactile paving is something that is very rare in North America even in places where the Americans with Disabilities act has retrofitted accessibility), but how do I know when there are too many pedestrians for cyclists and pedestrians to share effectively, how long do they have to cross a traffic light controlled intersection? I know that pedestrians can cross just about anywhere they like, except for the obvious, motorways for example, and except on a red man signal, but what is the meaning of parallel dashed lines flanking a crossing for pedestrians? Does it mean they have priority? Does it mean they don’t? Can someone explain? Also I notice that pedestrians often at traffic lights have median refuges and separate pedestrian signals governing one half of the crossing for pedestrians. Does this mean that pedestrians often have to wait in the middle? Or is this very rare? The parallel dashed lines do not indicate priority; I guess they simply indicate that this is a crossing point for pedestrians, as a warning to look out. There is a rule that that traffic going straight has priority over turning traffic on the same road. This does apply to pedestrians too. Sharing is almost automatic. If there are too many pedestrians, cyclists slow down. If it gets really busy, they will dismount and walk. Often the dashed lines are combined with traffic lights that impose priority rules. How do pedestrians get priority, if they are even able to have priority, in a 30 km/h uncontrolled intersection? Coming from a North American perspective it was very surprising that pedestrians don’t automatically have priority at every crossing, only when the traffic light for them shows a green man and at zebra crossings (except in the UK where you have to be on the crossing to get priority, which is a weird catch 22). In North America every driver is expected to stop for you, and I’ve never encountered a crossing where there were no traffic signals and the cars didn’t stop for me. Your ‘pedestrian crossing’ is the equivalent to our zebra crossing, meaning that pedestrians always (should) get priority as soon as they intend to cross the road. At places where a zebra isn’t wanted for reasons mentioned by Nederlander above, we use the canalization lines. It simply means there is a pedestrian crossing with lowered curbs and that traffic should look out because there is a bigger chance that people will cross the road there, rather than some place else. You could argue that people are less likely to stop for a ped crossing in North America because they’re everywhere, and people start to forget about the priority rules or choose to ignore them (happens often enough, especially in cities). And don’t forget uncontrolled intersection means uncontrolled by traffic lights. We still have rules, like traffic from the right has the right of way, traffic+peds going straight have priority over turning traffic, etc. Then again, without lights there’s never any waiting, so if the situation is unclear people just figure it out on the go. This entry was posted on 1 March 2016 by Bicycle Dutch in Original posts and tagged cycle parking, Leiden, railwaystations.